Get out on the water and lure in some trophy fish with a 4 hour charter off the coast of Miami and its surrounding beaches. Get out on the water and lure in some trophy fish with a 4 hour charter off the coast of Miami and its surrounding beaches. A 42’ Custom Carolina sport fishing boat, a crew with over 30 years experience and all the latest in fishing technology will give you the competitive edge. All fishing gear, including tackle, bait, ice, fuel and license. The green and blue Florida water offer up the perfect conditions for recreational sport fishing. Whether you’re on vacation in Miami or a local, you’ll be brought out to hidden gems with pockets of fishing waiting to bite. Don’t just lie on Miami beach. 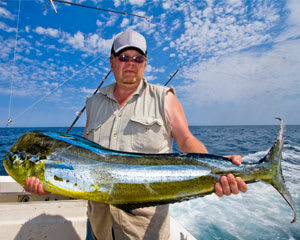 Test the waters with a fishing charter and you’ll be sure to reel in a few!